This is one of the first cocktails I ever created and it's still one of my favorites. I love a Key Lime Pie but it has to be in a pastry pie shell, not a graham cracker crust and I prefer a meringue topping over whipped cream. There's a lot of versions out there, but that's my favorite style and the one I styled my original recipe around. 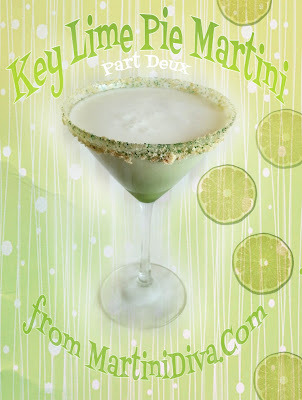 My first Key Lime Pie Martini recipe called for limeade concentrate instead of key lime juice because the first time I made the cocktail I used actual Key limes and drove myself crazy trying to juice the little buggers without a decent juicer. Key limes are small and hard and I spent forever rolling them around trying to loosen up the juice inside. So I tried a frozen limeade for my next version and, though it didn't have that Key lime flavor, made a pretty decent, and way easier, drink. It also had the sweetener already included. Plus Key limes aren't always available and I could keep frozen limeade always on hand in the freezer. Now I have a juicer so there's no excuse for not using fresh Key lime juice when they're in season. Gotta love the mod-cons, especially if you're in the cocktail business. I do love my juicers, especially when it comes to extracting Key lime juice. This Part Deux version I decided to try out rum instead of vodka. If you prefer vodka, go for it, but be aware that the rum brings a stronger flavor profile to the game than vodka does so there will be a different taste experience between the two spirits. DIRECTIONS: Blind bake a single layer of sugared, prepared pie crust, cool, then crumble. Mix with a teaspoon of sugar. I added in a bit of green sugar crystals for extra color. 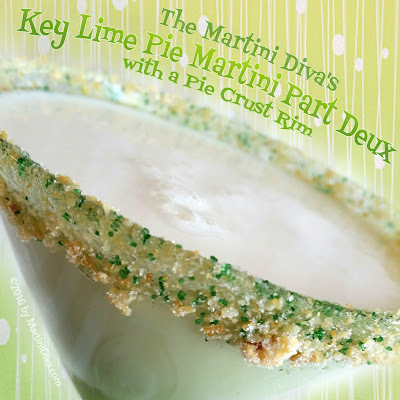 Dip the glass rim in some lime juice then into the crumbled pie crust mixture. Chill glass in the freezer. Add ingredients to a cocktail shaker filled with ice and shake until icy cold. Strain into the chilled glass and serve. National Key Lime Pie Day is September 23rd. You may wonder why you are getting two different versions of this edible cocktail. There's two versions because I had tons of lovely custard cocktail gel left over after making the samples for the photo shoot. Why not make a pudding cocktail too? So I did. I hand made these chocolate cups because my chocolate mold did not come in time. You can also buy ready made chocolate cups at Amazon. I'm doing that next time, it's just plain easier - though I did infuse my chocolate cups with a nice little pinch of sea salt. You can also make your own alcohol infused whipped cream. 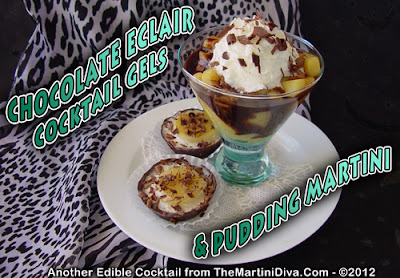 Tip: If you want a firmer custard cocktail gel to serve without the chocolate cups just add one additional package of gelatin to the custard recipe. Spray your cake pan and set aside. Mix the caramel sauce in with the cake vodka and set aside. Place the milk into your saucepan and sprinkle the Knox in, stir and allow to settle for a minute or two. Heat on low setting until the gelatin is completely dissolved, about 2 to 3 minutes or so. Remove from heat and set the gelatin milk mixture aside. In a separate bowl add the remaining 1 cup of milk and the pudding mix and beat for about 1 minute or until the pudding is completely incorporated. Add in the gelatin milk mixture, mix well. Immediately add the 1 cup of cake vodka/caramel sauce mixture and mix for another minute. Pour into your greased cake pan and let set for at least an hour. Once your pudding gel has set up you are ready to cut or scoop. Melt your chocolate chips in a double boiler until smooth and creamy. Avoid getting any liquid into your chocolate as this will cause the chocolate to seize up. Add a pinch of salt and gently stir in. Pour this into chocolate cup molds and put in the fridge to set up. Spoon a dollop of the alcohol infused whipped cream into the cup leaving enough room to set in the custard gel. Gently place your custard cocktail gel into the whipped cream. Shave on some dark chocolate and plate. Scoop some little spoonfuls of the cocktail gel custard into a small martini glass leaving some open spaces. Pour the chocolate syrup around the pieces and let it drip down into the spaces. Top off with the alcohol infused caramel whipped cream. Shave on some dark chocolate and serve. There's a hilarious Instagram account called Taste Of Streep that takes Meryl Streep and Photoshops her into all types of food. It tickles me funny. 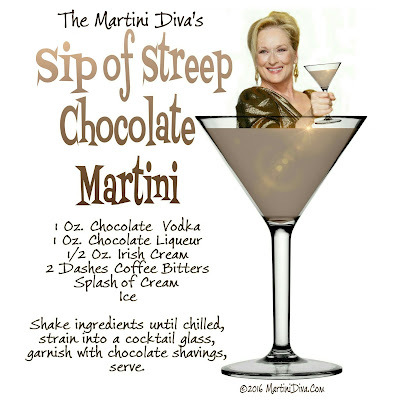 If you're a Streep fan and a foodie you can't help but enjoy these photo mash-ups, they're just perfectly silly and fun. 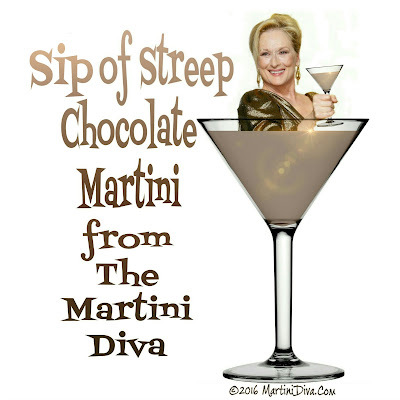 Besides the requisite doughnut, cannoli, pizza, et al., they have dropped Meryl into a glass of milk, a cup of coffee, a beer, a glass of wine and a pina colada but they neglected a martini. DIRECTIONS: Shake ingredients with ice until chilled, strain into chilled cocktail glass, garnish with chocolate shavings, serve.